Xypher has one month on Earth to redeem himself through one good deed or be condemned to eternal torture in Tartarus. But redemption means little to a demigod who only wants vengeance on the one who caused his downfall. Simone Dubois is a medical examiner with a real knack for the job. Those who are wrongfully killed appear to her and help her find the evidence the police need to convict their killers. But when a man appears and tells her that she’s more than just a psychic, she’s convinced he’s insane. It was bad enough when just the dead relied on her. Now’s there’s the seductive Dream-Hunter Xypher who needs Simone’s help in opening a portal to the Atlantean hell realm to fight insatiable demons. The future of mankind is at stake—and so is her life. The only question now is: Who is the bigger threat: the demons out to kill her, or the man who has left her forever changed? OMG I can’t believe I did this! I was about 60% through reading this book when I found out what I did. You see, I have the books in this series stacked in order to be read in my book closet. So when I can finally get around to reading one, I just have to pick up the book on the top of my Dark-Hunter pile and read it. Well…apparently I didn’t quite stack them correctly because I was due to read book number 11 in the series, Dream Hunter. I only noticed the title of the book I was reading when I got to page 200ish when I peeked at the top of the page and saw ‘Dream Chaser’ written there. Um, what?! I checked and sure enough, I must have stacked the books wrong, only having looked at the word ‘Dream’. Well, I was that far into the book and quite enjoying it, so I just kept going. I will say that I didn’t feel lost at all…well, not really. I didn’t know Ash had Katra but *shrugs*. 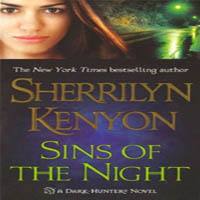 I just went to Sherrilyn Kenyon’s website and looked her up. (LOVE Sherrilyn’s site!) And I was thinking it a bit odd that Sherrilyn wrote a whole book focusing on a hero we had yet to meet or even hear of… (Turns out we do meet him in Devil May Cry. We even find out where his ‘bargain’ comes from. So Sherrilyn did not write characters out of the blue. Of course. What was I ever thinking?.. ;)) And that is the story of why I went from reading book 10 to book 14. 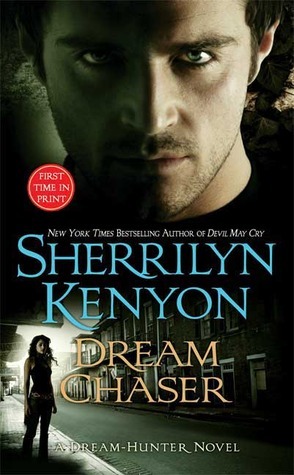 Dream Chaser is the fourteenth book in Sherrilyn Kenyon’s Dark-Hunter series. I didn’t find there was much to this story. What I mean by that is while reading, there really wasn’t much going on. It wasn’t the sort of story where this happened then this happened only to have this happen and so on. But the pacing was great and I couldn’t wait to see how the book ended. Man…I’m not sure if that came out right. It was a very good book. Really! The story is about how Xypher is trying to get Satara in order to kill her but is ‘stuck’ with Simone for a while. That’s it but it’s enough. Sherrilyn… Her heart must break as she writes her heroes. Boy are these guys tortured and are they ever deserving of love and affection! I wonder if she cries while she writes… Xypher was rough around the edges. He was supposed to come across as a tough heartless guy but I didn’t feel that way about him at all. As soon as you meet him, you just know that there is an ooey-gooey center in that big ol’ jerk. He’s not used to feeling emotion (that’s a Dream-Hunter thing) and all that is supposed to be on his mind is revenge. He was tricked (of sorts) by Satara. She’s the reason he is forever being tortured in Hell. And wants her dead. And when you find out what she did, you will want her to hurt too. And for a very short while that is all he thinks about. Until he meets Simone that is. Jesse is Simone’s ‘ghost’ friend and he is fantastic. He’s been around Simone since she was a teenager and now they are like brother and sister. He even has his own room in her apartment! I loved reading the two of them together. Their friendship and care for each other was really well written. You couldn’t help but smile when they were together on the page. Of course, Acheron makes a couple of quick appearances and as usual, they are leave their mark. I will probably say this same thing when I write my review for Acheron but Sherrilyn is some kind of genius to be able to take what is pretty much a side character and make him as memorable as he is. Every time Ash appears on the page, you take extra notice. There is just something about him that is spectacular. He is so layered and complex yet down to earth and lovable. He is by far one of the best characters out there and I can’t freaking wait to read his book! I was also happy to see Julian again. He is the hero in Fantasy Lover –one of my favorite books. In fact, that is the book I sent to Sherrilyn to have signed. He is just so fluid on the page, if that makes sense. I always love re-visiting with main characters from past book, especially when it’s a hero I really enjoyed reading. Overall, I found Dream Chaser to be a solid read. Xypher and Simone make an excellent couple – they complement each other very well. And I love romance books where there is lots of page time spent with the hero and the heroine together and this book was full of Xypher and Simone time. And now I go back to book twelve in the series, Devil May Cry, because I was told that it’s a pretty important installment to get in before diving into the most epic book in the series, book fifteen. Man I love this series. 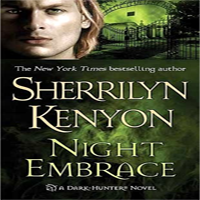 Share the post "Review: Dream Chaser by Sherrilyn Kenyon (Dark Huner #14)"